This post contains spoilers for Logan, now in theaters. Though Logan is one big cross-country chase, the latest X-Men spinoff makes time to tip its hat to a source of inspiration. For a brief stint, our heroes Wolverine (Hugh Jackman) and Professor X (Patrick Stewart), along with a young mutant named Laura (Dafne Keen), are hiding out in an Oklahoma City casino-hotel. Eventually baddies catch up to them -- Professor X painfully freezes the central nervous systems of the whole town so Logan can go around stabbing assassins -- but the hideout allows them a brief moment of familial downtime. And that's when they flip on the TV and watch scenes from the 1953 Western Shane. Should You See 'X-Men: Apocalypse,' One of the Cartooniest Movies Ever Made? 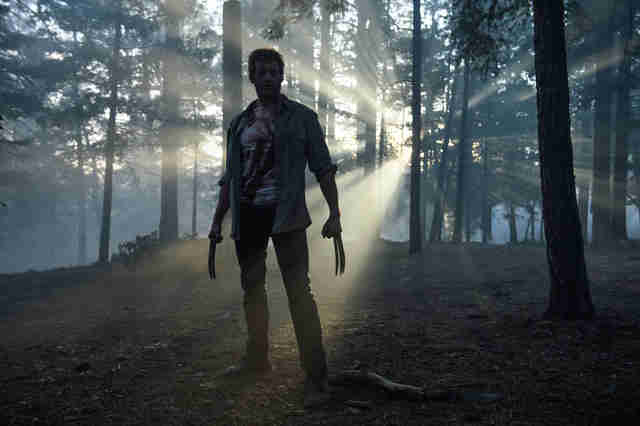 This third and (probably) final Wolverine movie riffs off a number of great cinematic melodies. When Logan (Hugh Jackman) and Professor X (Patrick Stewart, who rules) discover the first new mutant to turn up in years, and race across the dystopian countryside to an unlikely sanctuary, it is more than a little reminiscent of Children of Men. Logan and the Laura share one of the film's few moments of levity, and the vibe is straight out of the 1970s masterpiece Paper Moon. 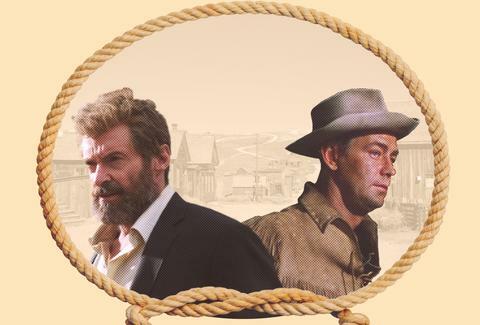 But when the lamming-it trio stop in for a night with farmer Eriq La Salle's family and discover he's being pushed around, that's when Hugh Jackman inhabits Alan Ladd's Shane, from director George Stevens' Technicolor classic. 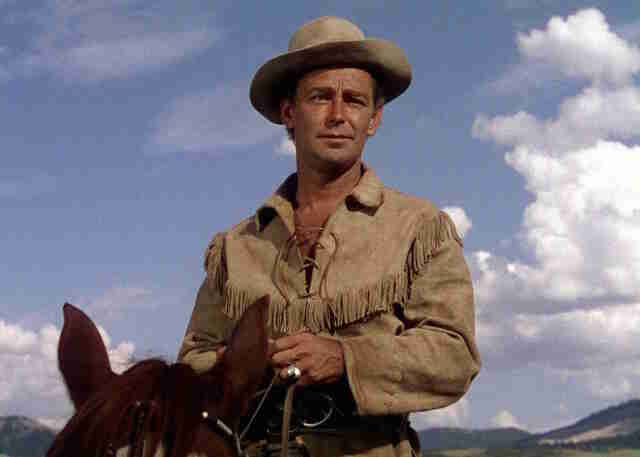 Shane is a classic Western that, along with The Searchers, High Noon, and Rio Bravo, major American film directors like Martin Scorsese and Woody Allen cite as a great influences. At first blush, Shane can look a little too square to take seriously in our current pessimistic and postmodern climate. Especially if all you know about it is that a little kid cries "Shane, come back!" at the end. Luckily, Jackman, director James Mangold, some artery-severing adamantium claws, and the X-Men franchise's first-ever R-rating set the record straight about the lonely codes of the classic American outlaw, running from one's destiny, and the ravages that a lifetime of killing has on a body and a soul. “I'm the best at what I do,” goes the classic Wolverine quote, “but what I do isn't very nice.” This sentiment has its roots in Shane. The Western is straightforward shot of drama. A mysterious drifter (Shane!) is passing through Wyoming, and starts chatting up an extremely "aw gee whiz" kid. The loquacious child's father is a hardworking homesteader, and his mother makes pie and smiles. But now a big rich jerk, who lived in the area when it was open range, is bullying the individual farmers. It's up to Shane (who has a violent past) to go forth and stand up for what's right. You can dig into the roiling psycho-sexual subtext all you want -- and many have, including the French! -- but Shane is a simple, pure, and elegant movie, and has been inspiring filmmakers for nearly 65 years. Director George Stevens, who also made Giant, an extraordinary Western starring James Dean, and The Greatest Story Ever Told, a Jesus biopic that works in a pinch if you are ever short on Ambien, stages an outstanding and lengthy barroom brawl in the middle of Shane. It's a little bloody for 1953, especially for an audience that is meant to include children -- so many chairs shatter over another guy's head. Importantly, all of the action in the movie is intercut with reaction shots of "Little Joe" (Brandon deWilde, who was 10 at the time) and there's a "not in front of the kid!" aspect to all the violence. But it was likely deemed necessary because it showed what guts it took for Shane to be a hero. You leave the movie aspiring to be like him, or at least have a father smart enough to take him on as a hired hand. Logan cranks the ideas in Shane up a notch. The avenging Wolverine slicing off limbs right alongside Laura, revealed to be a daughter/clone who shares his powers (adamantium claws and a healing factor), but even levels-up with blades in her feet and more acrobatics that befit a young girl. Wolverine's battering ram build compared to her grace. The skull-drilling and amputations are a bit shocking, but (unlike many contemporary violent movies), rooted in the drama of these characters. For the superhero genre, specifically the X-Men series that very recently had January Jones camping it up in go-go boots, this level of gritty, un-stylized violence is a bold choice. "There's no living with a killing," Shane tells Little Joe, and Logan echoes in a speech to Laura. "Right or wrong, it's a brand, a brand that sticks. There's no going back." For all the deification going on in Shane and Logan, both heroes make it clear that there are some actions for which there is no redemption. James Mangold holds a mirror up to Logan and reflects him back as Shane. He miraculously pulls it off, doing something that audiences and box-office watchers have already established, but few critics were ready to admit it. The superhero movie is no longer just quips, spandex, and fan-service. It's a major American genre, and one that is malleable for the silly and the profound. And Logan is the most profound one yet.